Texas Admissions | Undergraduate admission, scholarships and financial aid at The University of Texas at Austin. Undergraduate Admission information for The University of Texas at Austin. Learn about admission to the Graduate School, Dell Medical School or School of Law. You’ve worked hard to get here, and your adventure is just beginning. When you come to the University of Texas at Austin, you’ll get one of the best values in public education. Innovative, hands-on learning opportunities and a strong foundation in critical thinking will prepare you to lead in your chosen field. Texas is an experience, and a first-class education that will help define you for the rest of your life. Here, you’ll find a diverse and dynamic student community connecting to conquer challenges, serve others and forge new paths. What majors do we offer? What do we mean when we talk about “the Forty Acres”? And why is the Live Music Capital of the World such a big deal? See what makes The University of Texas at Austin great. The application process is designed to allow you to share your academic and personal information so that we may fully consider you for admission to UT. Find out how to submit your complete application for admission. UT is committed to partnering with students and their families to make education accessible to all. Do your part by applying for scholarships and financial aid. Then we’ll do ours. The years you’ll spend on campus will fly by. 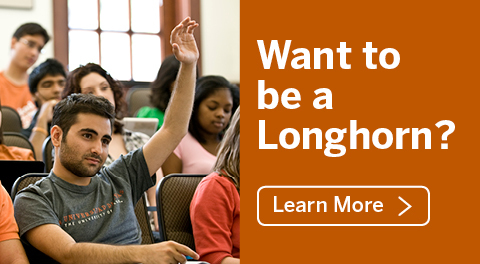 Make the most of them starting from Day One by taking advantage of resources designed to help you acclimate to life as a Longhorn.